Now I normally try and avoid cliches like the plague. But, in this case, I’ll make a notable exception. Biggest game of the season. Cup final. All or nothing. Do or die. Win or bust. This weekend’s game against Bristol City comes into all of those categories – and then some – as far as Latics are concerned. During Wigan’s Premier League adventure, Gary Caldwell once referred to a pivotal game against West Brom as a ‘seven-pointer’ – ‘because it’s bigger than a usual six-pointer’. And you cannot help but feel Saturday’s shoot-out also falls into that category. Second-bottom Latics gave themselves a real shot in the arm when they picked up three priceless points at Birmingham in midweek. It took them to within a point of third-bottom City, who have been sinking like a stone in recent months after a fine start to the campaign. Lee Johnson’s men have won only two of their last 22 league games, and only scraped a point in midweek courtesy of a late goal against Norwich, for whom Yanic Wildschut had scored the opener. Once a Wiganer, always a Wiganer! Perhaps more crucially, Latics are now just two points behind fourth-bottom Wolves, meaning three points could take them out of the bottom three this weekend. In fairness, Wolves have a couple of games in hand, but Latics are only three points behind fifth-bottom Blackburn, four behind sixth-bottom Burton, and only six behind sixth-bottom Nottingham Forest. A home win would also deliver a massive bloody nose to relegation rivals City, who would have only nine matches to respond. From being all doom and gloom after last Saturday’s dismal defeat at Blackburn, there’s suddenly hope and optimism in and around the DW Stadium once again. A negative result this weekend, and all that wind would be gone from the sails. With a horror last month of the season seeing Latics face promotion-chasing Brighton, Reading and – on the final day – Leeds, Latics have to make hay while the sun’s shining. The woefully out-of-form Robins are sitting ducks by comparison. Hopefully we’ll see a big crowd this weekend to cheer Latics on to another three points – and a real shot at safety. Now where did I put the keys to that ‘Believe’ bus...? It’s not been the smoothest of transitions for Warren Joyce into the Wigan Athletic management hotseat. 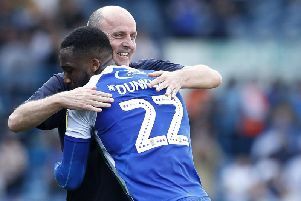 But even his most ardent critic cannot possibly dispute the commitment of the man, after returning to his post – against doctor’s orders – to try to help Latics out of their present predicament. If guts and determination, and pride and passion, in the technical area has anything to do with it, Latics will surely be fine come the end of the season. Of course, Latics against Bristol City isn’t the only important football match taking part in the town this weekend. Just up the road in Ashton on Sunday, ex-Bolton and England striker Kevin Davies will be selecting a team to play against the Great Britain Deaf Olympic Team, kick-off 6pm. Due to a lack of funding, Team GB have been working tirelessly trying to raise money to fund their forthcoming trip to Turkey, to play in the Deaflympics this summer. Those signed up to play for Team Davies include Latics legend Emmerson Boyce, TV/radio presenter George Riley and Ralf Little, star of ‘The Royle Family’. And Davies admits his passion for seeing Team GB reach their funding target comes is particularly close to home. “My father represented the same team back in 1965, and won a silver medal in Canada,” revealed Kevin. “I know what this meant to him and how proud he was, and how it was life-changing for him. The match will take place at Ashton Town FC, whose chairman, Mark Hayes, has hosted several high-profile charity events, including the annual Joseph’s Goal ‘Latics Legends’ match, which has raised well into five figures into NKH research. Entrance for the game at Ashton Town – Edge Green Street, Wigan, WN4 8SL – is just £5 pay on the night, and 100 per cent of the money goes to the Great Britain Deaf Olympic Team fund.